Looking for a New Subaru Crosstrek Hybrid in your area? CarGurus has 634 nationwide Subaru Crosstrek Hybrid dealers with 176 new car listings. The Crosstrek Hybrid is a more capable plug-in crossover than its rivals, even if it falls short on EV range and cargo space. 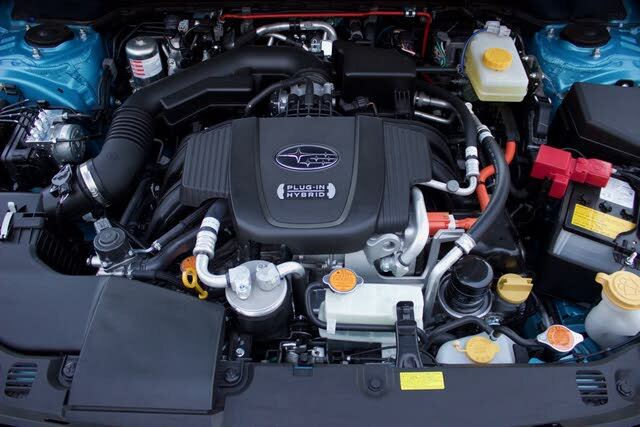 When the original Subaru Crosstrek Hybrid debuted in 2014, it was by no means early to the hybrid game. But most hybrids were sedans, and few automakers had attempted a hybrid crossover. As Subaru’s first-ever production hybrid, sold from 2014 to 2016, it signaled Subaru's interest in the green-car market. After a nearly three-year hiatus, the Crosstrek hybrid is back, now as a plug-in hybrid. However, it has some stiff competition. The compact crossover segment has exploded, and brought us some unique green cars for eco-friendly shoppers on a budget. You could get the RAV4 Hybrid back in 2015, but now there’s also the Kia Niro, Hyundai Ioniq, and Prius Prime (which was introduced in 2016) all offering plug-in capability and some modest utility. The new Crosstrek Hybrid has the latest infotainment and driver-assistance features, but will that be enough to ensure its relevance in this affordable green-car landscape? Visually, there are some details to help you differentiate the Hybrid from conventionally powered Crosstreks. All versions of the Crosstrek have added cladding around the bottom and around the wheel wells, but the Hybrid adds bright gray inserts along the side, front lower bumper, and framing up around the front fog-light areas. It also has the upgraded headlight clusters from the Crosstrek, but with added blue frames around the main headlight projector. 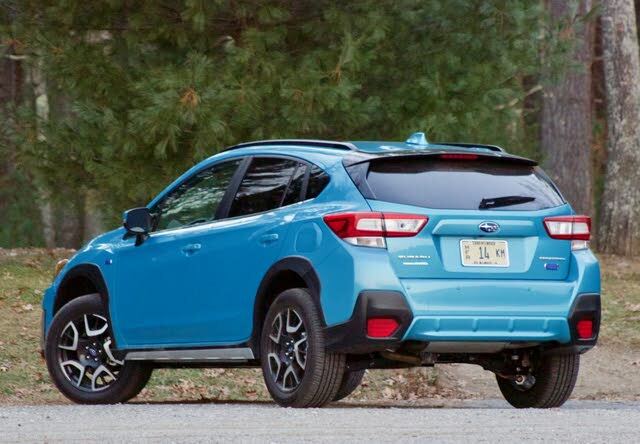 The Crosstrek Hybrid is available in black, white, “Cool Gray Khaki,” and “Lagoon Blue.” Our test car came in that last color, which is exclusive to the Hybrid, and is very eye-catching. Moving inside, the Crosstrek Hybrid has some unique cabin touches. Our test model featured very attractive blue inserts and 2-tone leather seats with blue contrast stitching. Impressively, the leather interior, heated front seats, and a power adjustable driver’s seat all come standard. It’s just the tip of the iceberg when it comes to the standard content on this car. There’s only one trim of the Crosstrek Hybrid, and it’s extremely well equipped. That’s partly because this car has to make up for a few shortcomings, including the lack of rear cargo space. 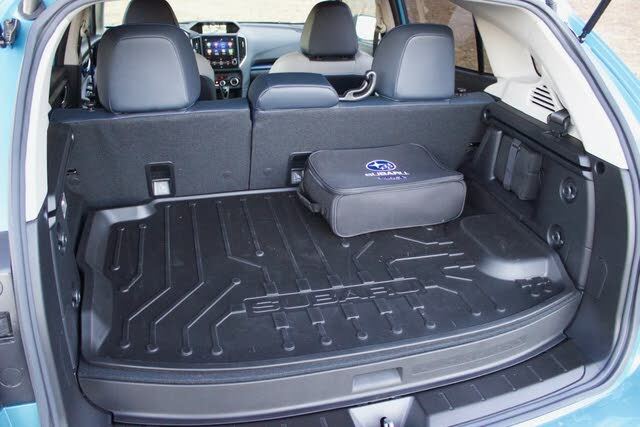 To make room for the battery, the rear cargo floor sits higher than in the conventional Crosstrek. So, our test model came with plenty of standard features, including 18-inch alloy wheels, body-colored power-folding side mirrors with integrated turn signals, fog lights, a roof spoiler, and adaptive headlights, which can be toggled via the Steering Responsive Headlights (SRH) button to the left corner of the dash. SRH allows the headlights to turn with the direction of the steering wheel, so the lights bend with the road. The Crosstrek Hybrid also comes with low-profile roof rails, which really don’t offer much utility, except for being a mounting point for the many Thule roof racks offered by the dealer. The standard windshield winter de-icer, however, is a clever feature for those who live in very cold regions. 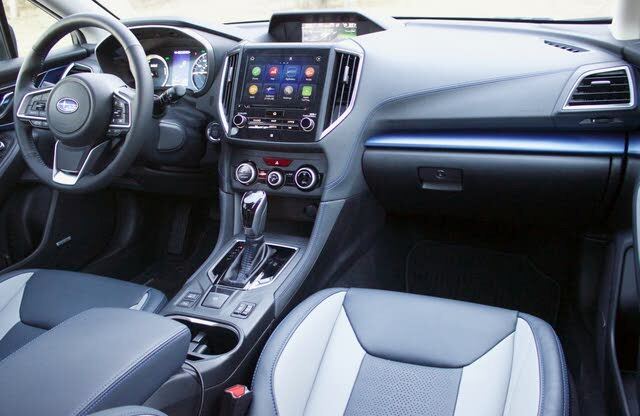 Inside, you also get push-button start, keyless entry, a folding rear armrest with cup holders, automatic climate control, a USB port, Bluetooth connectivity, and Subaru’s Starlink infotainment. In the gas-powered Crosstrek, Starlink comes standard with a 6.5-inch touchscreen, and shoppers have to buy the range-topping Limited trim to get the larger 8-inch screen. But on the Hybrid, the 8-inch touchscreen comes standard. All versions of Starlink are very easy to use, and come standard with Apple CarPlay and Android Auto. Given how much content is included, there’s really only one option package you can get for the Crosstrek Hybrid. It’s a $2,500 package that adds a power sunroof, navigation, a Harman Kardon premium stereo, and a heated steering wheel—a nice touch for cold winters. The Crosstrek Hybrid’s gas-electric powertrain sounds like a typical hybrid drivetrain at first, but it has some key differences. It uses Subaru’s typical 2.0-liter Boxer four-cylinder engine, but it makes just 137 horsepower and 134 pound-feet of torque. It uses a specially designed continuously variable transmission, or CVT, coupled with two electric motors. Electric energy is stored in an 8.8-kilowatt-hour battery pack. Here’s the key difference from other hybrids with all-wheel drive systems: All the hybrid integration happens before the drivetrain splits the power to the standard all-wheel-drive. Consider the Toyota RAV4 Hybrid and new Toyota Prius with eAWD, which use the combination system, with mechanical hybrid drivetrain power to the front wheels, and pure electricity to the rear. Those systems are technically all-wheel drive, but they lack the composure of traditional all-wheel drive. The Crosstrek Hybrid’s AWD system is as capable as any other modern Subaru. Which is to say, very. 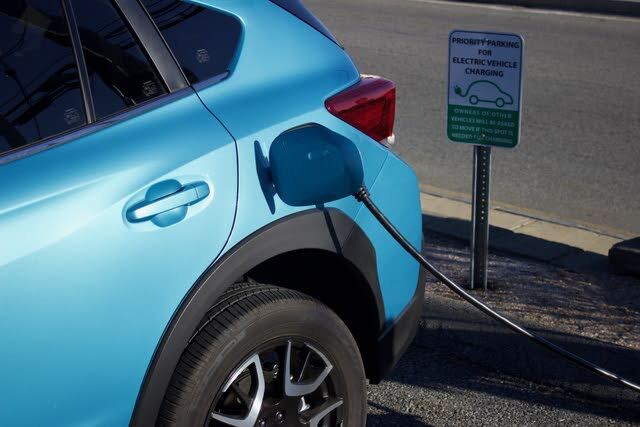 The plug-in system’s battery can be charged in five hours with a regular 120-volt power outlet, or two hours from a 240-volt charging station. Fully charged, it has an electric-only range of 17 miles, at a speed of up to 65 miles per hour. If necessary, you can preserve what charge you have by pressing a "hold charge" button located between the front seats. 17 miles is less than the Toyota Prius Prime (25 mi electric-only), Kia Niro Plug-In (26 mi), and Hyundai Ioniq Plug-In (29 mi). A notch below Drive on the shifter lives "Brake," which strengthens the resistance of the regenerative braking, so you can gain a bit of charge every time you decelerate. If the range is lacking, acceleration is even more underwhelming. Press the accelerator to the floor, and you'll hear a whole lot of noise, but you won't go anywhere fast. Subaru claims the Hybrid is a full second faster than a gas-powered Crosstrek in 0-60 sprints, but it’s the difference between 8 seconds and 9 seconds. The Crosstrek has Subaru’s SI-Drive, with Sport and Intelligent drive modes (not offered on the conventional Crosstrek), but even that can’t help the acceleration of this vehicle. The hybrid components also add an extra 500 pounds of weight. Take a corner, and it feels like there’s an anchor dangling from the back, trying to make your turns go wider. This is far from a driver’s car. It’s also not very refined, as you hear all the different system components click and hum as you accelerate and decelerate. But the Crosstrek Hybrid shines because it is a Subaru crossover, and comes standard with 8.7 inches of ground clearance, rugged suspension (compared to other compact hatchbacks), and the aforementioned standard all-wheel drive. It allows the Crosstrek Hybrid to travel confidently over rough surfaces, bumps, ruts, and it can even handle some light off-roading. You can’t do that in a Prius, I assure you. It also has X-Mode with hill-descent control, and technically, you could do it in full EV mode, for zero-emission off-roading. And with its electric range, the EPA gives the Crosstrek Hybrid a rating of 90 MPGe, or miles per gallon equivalent. Even if you run only on gas, it still gets a combined 35 miles per gallon. In a week of combined city and highway driving, I observed fuel economy of 33.6 miles per gallon. A trained eye—or Subaru obsessive—will notice there’s no handbrake. Instead, Subaru has replaced it with a little electronic emergency-brake toggle. This is due to the altered hybrid components in the transmission tunnel below. The use of the electronic parking brake also allows for a change in placement of the front cupholders, to side-by-side, making more room for the heated seat, battery-charge save button, and X-Mode toggles. Overall, the layout is similar to that of the conventional Crosstrek, with plenty of deep pockets in the doors and compartments in the center console. 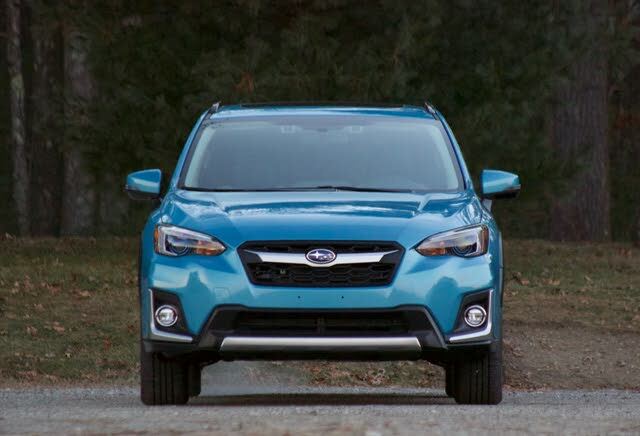 You sit somewhat upright in the Crosstrek Hybrid, which provides a commanding driving position. It also allows for a decent amount of rear seat space. At 6-foot-3, I was able to sit in the rear seat without any discomfort. Behind the rear seat is the cargo area, which is considerably smaller than that of the conventional Crosstrek. This is to make room for the battery pack. That leaves it with just 41 cubic feet of space, compared to 55 cubic feet in the gas-powered Crosstrek. 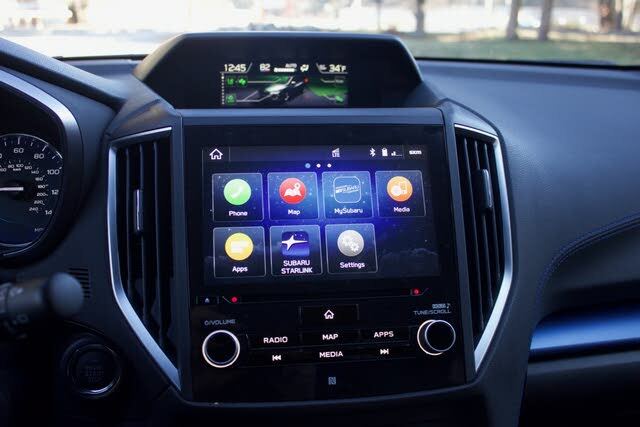 The Crosstrek Hybrid comes standard with Subaru’s premium Starlink infotainment system and an 8-inch touchscreen. Starlink has large, easy-to-read icons, a sensible menu layout, and has shown no sign of lag in the vehicles we’ve tested. It also comes standard with Apple CarPlay and Android Auto. The USB port is in the center compartment, but it would have been nice to have a port in the center tray, which is becoming more and more common in new cars (including other Subaru vehicles). Subarus are unique in many ways. One example is the color multi-information display, located atop the dash. I often don't like multiple screens in cars, but that’s only because they are usually unnecessarily complicated. The dual-screen setups offered by brands like Infiniti and Honda are both terrible, because one screen controls the other. In Subarus, the multi-information display is simply controlled by a button on the steering wheel, and provides multiple displays to monitor fuel economy, battery life, and hybrid system status. Standard safety features include front- and side-impact airbags, traction control, a reversing camera, and a tire pressure monitoring system. It also comes standard with Subaru’s EyeSight suite of driver-assistance features. EyeSight includes forward-collision warning and avoidance (pre-collision braking), adaptive cruise control, lane-departure warning, and lane-keeping assist. It also came with adaptive high beams, blind-spot detection with rear cross-traffic alert, and reverse automatic braking. Between the lane-keeping assist and the adaptive cruise control, EyeSight can provide semi-autonomous highway driving. Your hands need to be on the steering wheel, but we were very impressed with how fluid it felt. EyeSight also has a neat feature that alerts the driver if they're stopped at a light and the vehicle in front of them moves, and the driver doesn't respond. In our world of increasingly distracted driving, these features help keep you aware of your surroundings. 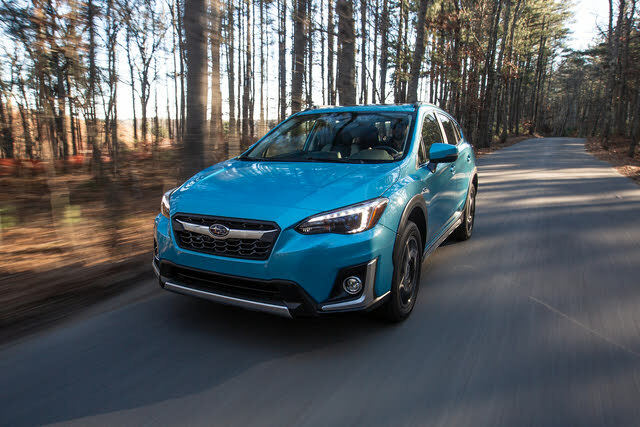 The base MSRP for the 2019 Subaru Crosstrek Hybrid is $34,995. The option package mentioned earlier adds $2,500, while standalone options include an auto-dimming rear-view mirror with compass ($365), STI Spoiler ($453), LED interior lighting upgrade ($99), and a whole host of accessories for the active lifestyle (I didn’t know so many different kinds of bike and kayak racks existed). Even without the options, that base price is not cheap. The Hyundai Ioniq Plug-In starts at just $25,000, and the Kia Niro is even less, starting at $23,490. The Prius Prime, the gold standard of the plug-In market, starts at $27,300 and maxes out around $33,000 fully loaded. You might argue that the Crosstrek is more of a crossover than any of those cars. Well, pricing for the Toyota RAV4 Hybrid is largely the same as the Prius Prime. We've looked at these rivals, and yes, they don’t come standard with as much content. But load up the Prime, and it still costs less than a fully loaded Crosstrek Hybrid. No joke: I had to double check the pricing breakdown of both the Crosstrek and Crosstrek Hybrid to make sure there wasn’t a less expensive trim of the car we reviewed. Word is this vehicle has limited availability. Whether that’s a state-to-state thing, a slow rollout thing, or an actual cap on number produced for this year, remains to be seen. Just know you might have to do some legwork to find one. So, is it all really worth it? It’s not as refined as a Prius Prime, costs more than the Prime, Ioniq, and Niro, and is not as spacious as a Toyota RAV4 Hybrid. But none of them are a Subaru. The brand has an extremely loyal following, and if there is a hybrid version of your favorite brand, you might put the work into finding one. Considering even the modest off-road capability, stout suspension, and particular layout of the all-wheel drive, the Crosstrek Hybrid is just more capable than the competition. And that just might make the difference for you. What's your take on the 2019 Subaru Crosstrek Hybrid? GuruV1MYK The Crosstrek is awesome but under powered in CO Mts, where I live. The hybrid should help. Electric motors should add horepower and much needed torque. Where do i sign up? Mert I am looking forward to upgrading the current Impreza lease to this next year! Jack As of October 1st, 2018, Subaru is radio silent. Dealers i've called are getting no information whatsoever from Subaru and there is zero, zip, nada about this car on Subaru's web site. It is obviously being quite delayed, if not worse. GuruXZB7G I also am waiting for release date, but dealers and Subaru USA are being quite cagey about any info. for prospective buyers. With many articles out ther, why the holding back with info unless there’s a some kind of delay, glitch? GuruXYN5Q I drove the 2019 Crosstrek over the weekend and loved it. Thrilled at the prospect of a hybrid, however, I need a new car in the near future . IF it's released this fall yet, could I buy it in one of the 10 states, drive it home to IL and have it serviced near home?? GuruXXD2L Like GuruV1MYK, I live in Colorado and found the Crosstrek/Impreza to be really underpowered for mountain driving. Eagerly waiting for the plug-in hybrid. I’ve contacted my legislators to urge them to get CO on the books with the zero emissions standards so that we can join California, etc. GuruX1WNY I hope that Subie is taking tech tips from Prius to get the gas mileage, but really hope they are not taking styling tips from Toyota and their ugly cars (esp. Prius). Eager to hear what the mileage will be. It might boil down to this or a Niro for my next car. Would really like Subaru to get the PHEV out in Colorado first, since many of their best customers are here. GuruX88P2 It's well into the 2019 model year (Nov 9, 2018) and there is no hint of a 2019 Hybrid Crosstrek coming from Subaru. I think Subaru will offer it as a 2019 model. To make it worthwhile, the electric thrust must add at least 30 HP and the MPG must increase to 38/37/36 (city/combined/highway). The plug in feature would add some eMPG. With gas prices where they are, who is going to pay a $5000 to electrify their Crosstrek?? Maybe that is why Subaru is waiting. GuruXPDL4 From my understanding they are only available in states where it is mandated to have a hybrid version and only residents of those states can purchase them. GuruBPBV6 I love the car but the interior design is horrendous. It looks like a skunk’s back. For that kind of money at least provide an upgrade option for an all black interior. Have you driven a 2019 Subaru Crosstrek Hybrid? Enter your zip to see incentives for a new Crosstrek Hybrid in your area. Looking for a Used Crosstrek Hybrid in your area? CarGurus has 112 nationwide Crosstrek Hybrid listings starting at $14,600.